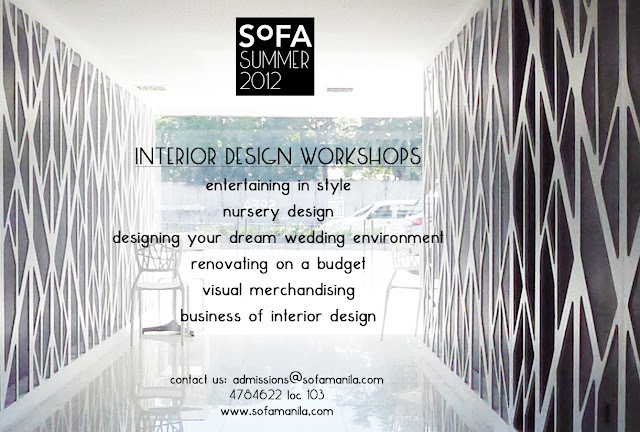 manila fashion observer: SoFA this Summer! Thinking of ways to make your summer more productive? Check out SoFA's summer programs - there's a program for you, as well as the kids at home, to help channel all that creative energy! 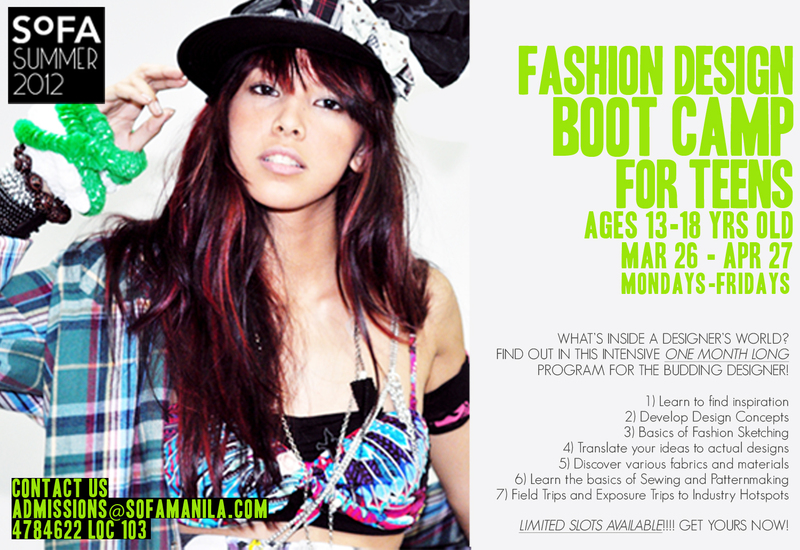 The SoFA Fashion Design Boot Camp for Teens is where budding fashion designers spring into action! 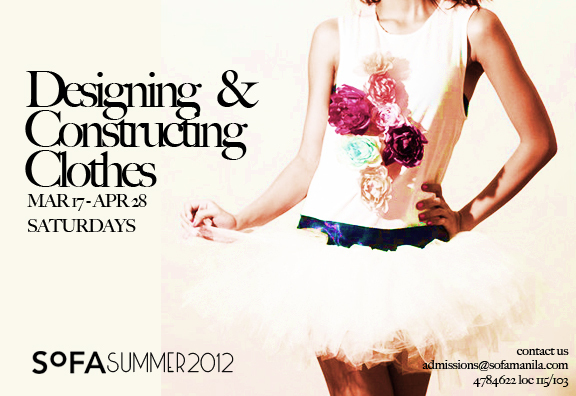 This intensive 1-month long summer program gives an introduction into the world of Fashion Design. This program, which meets on a daily basis for a month duration, will walk aspiring designers through the steps of the creative process from inspiration, conceptualization, design combined with hands-on activites in sewing & construction, field and exposure trips. Students will be able to experience what life as a fashion designer entails while gaining basic fashion and design knowledge and skills. This program is aimed for teens 13 to 18 years old. Runs from March 26 to April 27. 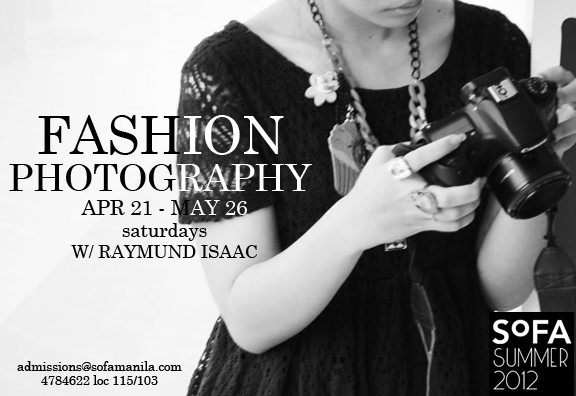 Fashion Photography Workshop by Raymund Isaac gives you the opportunity to learn from one of the Philippines’ photography masters. Learn how to work settings and equipment according to themes and environments to achieve editorial worthy output. This 6-session workshop begins April 21. 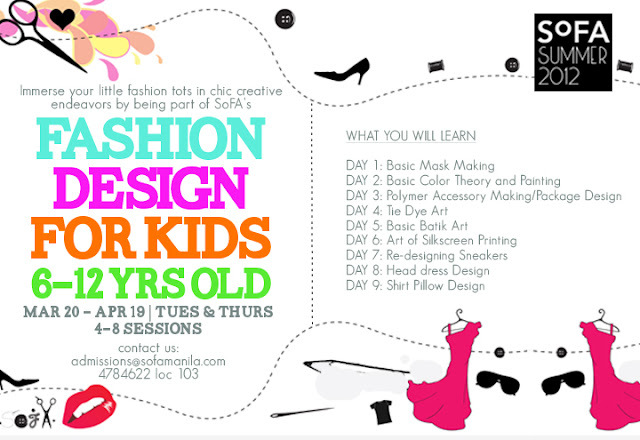 SoFA Kids Fashion Camp Immerse your little fashion tots in chic creative endeavors. This 8-session workshop covers jewelry making, t-shirt designing, denim deconstruction and other ingenious creative outputs will begin on March 20. For ages 6 to 12 years old. Basic and Advanced Makeup Techniques Artistry has gone beyond the confines of canvas and fabrics. Many Filipina women are getting into the discipline of makeup artistry, so this summer, SoFA is offering a comprehensive 4-session Basic Make up Techniques workshop which include topics like prepping, blending and experimenting the face with day time and night time looks. Starts May 5. 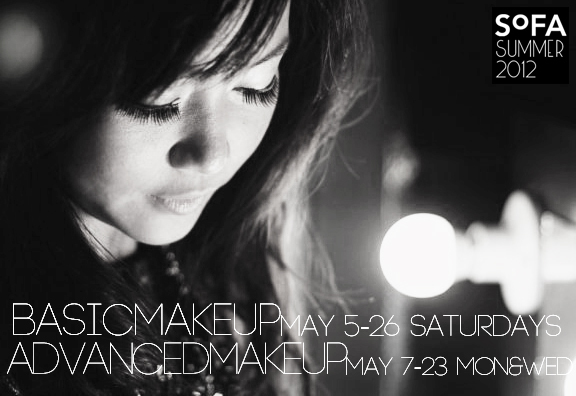 For the established practitioner looking into updating their skills, Advanced Make up Techniques which will begin on May 7 might be the boost they’re looking for to address their needs. For budding designers who are interested in getting into the craft, we’re offering basic design foundation classes such as Designing and Constructing Your Own Clothes and Illustration for Beginners. Both workshops will begin March 17 respectively. All this free time may just be your chance to do a bit of sprucing up at home. Tap the creative and resourceful genius in you by enrolling in Renovating on a Budget. Familiarize yourself with essential decorating knowledge and practical knacks that will help you save on your next home renovation. Personally plan and decorate for your house parties from here on. Be acquainted with the essential how-to’s and what-not’s of event planning and decoration with the 4-session workshop on Entertaining in Style. Expecting parents and bride-to-be’s need not worry where to begin! SoFA is offering a comprehensive 6-session workshop on Nursery Design and a basic 4-session course on Designing Your Dream Wedding Environment. Hobbyists and professionals need not have a background in Fashion or Interior Design to enroll. You may call the Admissions Office at 4784622 loc. 115/103 or email admissions@sofamanila.com for more information on schedules, rates and other workshop details. 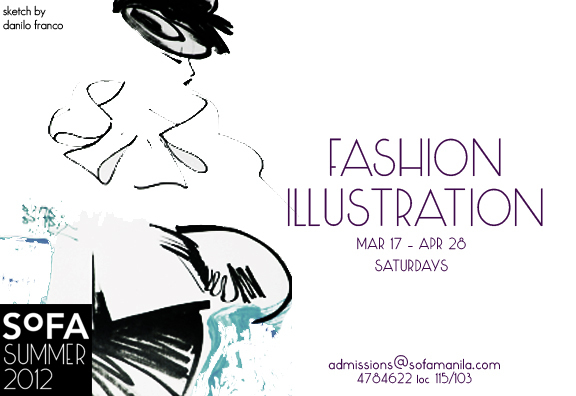 March 26- April 27, Mon-Fri, 2-6pm (MWF) 9-1pm (TTH). March 20- April 19, Tues and Thurs, 9-12nn. March 17- April 21, every Saturday, 9-4pm. March 17-April 28, every Saturday, 12-4pm. May 5 – May 26, every Saturday, 9-4pm. May 7- May 23, Monday and Wednesday, 4-7pm. April 21 – May 26, every Saturday, 9-12nn.